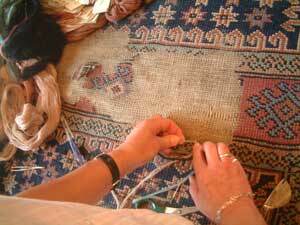 Rug repair advice and quotations are given free of charge. 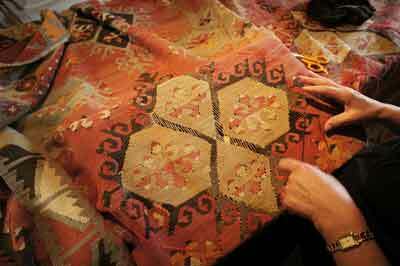 Our rug restoration workshop here at OlneyRugs is open to the public. If you care to visit you will see our skilled restorers using proven traditional techniques to achieve outstanding results. We offer a collection and return service and if required we can send two men to move furniture. All rugs will need to be cleaned before we can make any repairs RugRevive cleaning service. Axminster and wilton rugs repaired. Cleaning and Vibro dusting included. Below are a few examples of the work we have undertaken.